For fans of the wildly popular, family-friendly minivan, the five-door multi-purpose vehicle sure has come a long way since launching in the early ‘80s. Minivans may have started off with more of a soccer-mom reputation to replace the traditional family station wagon. Lucky for the minivan, times continue to change as family transportation takes on more of a modern approach. The last few decades have seen a trend-setting introduction of minivan models to the market, including Toyota’s stylish and innovative Sienna in 1998 that replaced the mid-engined Previa. The Toyota Sienna’s popularity has helped the minivan emerge as a cool alternative to drive everyone from the kids to school to the entire band to practice. 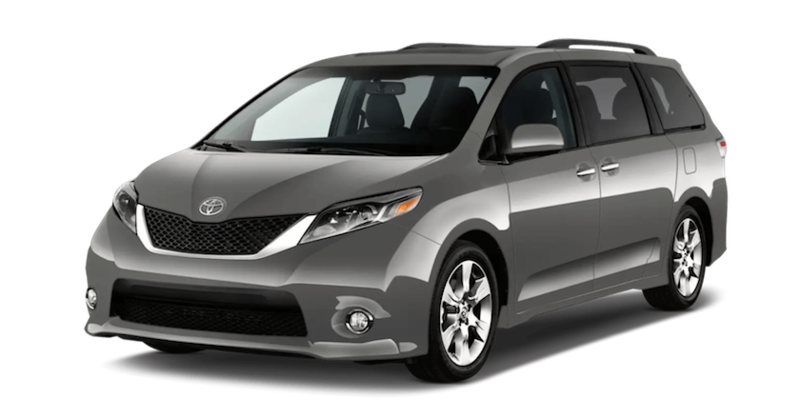 Today, a used Toyota Sienna will help buyers make the transformation to the world of minivan ownership smooth by saving them precious time and money while providing all the space, safety and style needed in 2019. Not quite as large as other minivan models, the first generation of Sienna as the world welcomed the 2000s proved to be a perfect option for families, teams, organizations, and groups requiring much-needed space at an economical price. And with a 3.0-liter, V6 engine, it had the get-up-and-go to appeal to all types of drivers. Not only does a used Toyota Sienna for sale at McCluskey Automotive in Cincinnati, OH, harbor on the safe side — it’s the only minivan in its class to feature all-wheel drive — but the Sienna is also increasingly affordable and accessible. The current 3rd generation Toyota Sienna, available at McCluskey Auto, is the first to receive a "Top Safety Pick" award from the Insurance Institute for Highway Safety. Developed and manufactured in North America, Sienna’s commanding V6 engine, expansive cargo space, user-friendly infotainment system, an optional navigation system, and all-wheel drive make it the minivan to drive in 2019. The 3rd generation Toyota Sienna minivan began production in January 2010 with a considerable makeover. The Toyota Sienna’s exterior bodywork and suspension were vamped up, including adding clear tail lamps, and the minivan’s steering was tuned to be a little sportier. In 2010 the standard transmission was a 5-speed automatic however starting in 2011 this minivan featured a 6-speed automatic transmission and would for many model years. Carried over from earlier generations this model year Sienna was available with all-wheel drive in the higher trim levels and made the Sienna the only North American minivan with an available AWD drivetrain. This year’s facelift from the previous generation also included an upgrade from hydraulic power steering to the Electric Power Steering system. This means steering assist will kick in if the engine stalls, boosting Sienna’s safety for drivers. Updated technology also included Toyota’s keyless Smart Key System and Push Button Start. Passengers of all ages can remain entertained during a drive with optional rear-seat 16.4-inch LCD screens that operate in two view modes — single widescreen or two split screens. The front dash in the Used Toyota Sienna has been updated from previous generations to include a driver's knee airbag and a backup camera with a new 180° panoramic view for added safety. Speaking of safety, features such as a Pre-Collision System, automatic high beam dimmer, Safety Connect, and the Vehicle Integrated Dynamics Management added a more advanced stability control system which really makes the Sienna shine in its class. The new, redesigned 2011 Sienna featured a six-speed automatic transmission for the first time, making it a sportier option for the next generation of minivan customers. To provide some added comfort an optional sliding second row with reclining lounge seating was added. The 2011 model won the Insurance Institute for Highway Safety's Top Safety Pick Award for side and diver airbags, electronic stability control, antilock brakes, and daytime running lights for safety. The 2012 Toyota remained the only minivan to feature an all-wheel-drive option. Toyota's new navigation system with Entune connected navigation system became available with the 2012 Toyota Sienna, boosting its appeal for the newest spectrum of tech-savvy minivan drivers. Drivers chose the 2012 Sienna for its 2.7L 4-cylinder engine with 187 horsepower, comfortable ride for eight — thanks to its functional second row — and spacious cargo room. In 2012, it grew in size, and featured road trip-worthy reclining second-row seats with leg rests as well as a split-screen entertainment system for watching two separate programs simultaneously. In 2013, the Toyota Sienna’s 2.7L, four-cylinder engine was dropped, and a peppier 6-cylinder, 3.5-liter, 266-hp, V6 became standard in the popular front- and all-wheel-drive model. This gave the Toyota Sienna a sportier edge in the market and had people talking about its impressive powertrain. New amenities in 2013 also included a standard three-zone automatic climate control system for the LE grade, a cabin air filter, and individual temperature settings for the driver, front passenger and rear-seat passengers. In 2014, the U.S. News & World Report ranked the Toyota Sienna #1 in its minivan category. It was most noted for its “potent” V6 engine, with 266 horsepower, and “roomy, comfortable” cabin. It remained the only minivan available with all-wheel drive. New in 2014 were the standard blind spot monitoring system and the rear cross-path detection on the Sienna SE trim as well as a newly found 3,500-lb towing capacity. The Sienna’s updates such as a rearview camera and backup sensors helped win the 2014 Best Resale Value Award for minivans. The 2015 model year brought the first significant rejuvenation to the 3rd generation Toyota Sienna, especially regarding style. Exterior improvements including new tail lights and stylistically updated headlights with LED daytime running lamps as well as some interior tweaks that featured a new user-friendly dashboard, updated gauges, and climate control. Trend-setting paint colors were also added, these were Sky Blue Pearl, Creme Brulee Metallic, and Attitude Black Metallic. In that year, the U.S. News & World Report ranked it #1 in 2015 Minivans. New for the 2016 Toyota Sienna was the addition of the Scout GPS App Link, featuring voice-prompted turn-by-turn directions, voice-activated search, steering wheel-activated voice recognition, and traffic updates. Scout even provides gas price updates and an easy virtual search of the closest gas stations. The U.S. News & World Report ranked the Sienna #2 for 2016 Minivans, and a finalist for the 2016 Best Minivan for the Money and 2016 Best Minivan for Families. This was a big year for the Sienna and certainly loved by critics. If you can find a 2016 Used Toyota Sienna for Sale, it is sure to impress. As for the exterior, no major changes were implemented however the interior materials were updated to feel more luxurious than previous years. In 2017, the Toyota Sienna replaced its previous six-speed transmission with an eight-speed, along with a revised and added direct injection fuel system. The benefit is in fuel efficiency — the eight-speed transmission is reported to improve fuel economy by as much as 11 percent and pushed the fuel efficiency to 19 mpg city and 27 mpg highway. The Toyota Sienna’s 3.5L V6 engine saw some boosts upping horsepower from 266 to 296. This was the last model year before some big changes came the Sienna’s way. On the exterior, alterations made to the 2018 Toyota Sienna that had people noticing included new headlights, front grille, and side skirts, giving the Sienna a more sleek and sporty appearance. Some quick fixes were made to reduce street-noise and vibration by including a noise-reducing windshield. Toyota’s Safety Sense bundle of safety systems were made standard as well some creature comforts like a power-sliding rear door, roof rails, and a power-adjustable driver seat. Safety Sense features the Pre-Collision System with Pedestrian Detection integrated camera and radar system, Lane Departure Alert via a windshield camera, automatic high beams, and Dynamic Radar Cruise Control. The 2018 Toyota Sienna updates also included additional USB ports, and a rear entertainment system upgrade as drivers and passengers continued to demand more connectivity. The infotainment system also included HD and satellite radio while the Entune app continued to connect users with a plethora of useful applications like Pandora and Yelp. And as a crowd-pleaser, this model year offered an optional Wi-Fi hotspot for passengers to connect to on long rides. Let’s be honest. The past reminds us that some used car dealerships out there have an often-misunderstood reputation for rubbing people the wrong way. Maybe it’s the cliche of the persistent and shady used car sales tactics. Or the inconsistency in pricing offered from dealership to dealership. At McCluskey Automotive in Cincinnati, OH, we’ve changed all that. McCluskey Automotive doesn’t play used car sales games that leave customers wanting more from their experience. Our goal is to make our customers feel comfortable in the car-buying process. As if they’ve walked on to a luxury car dealership designed just for their individual buying process. Buying a car, new or pre-owned, is personal. We want our customers to feel relaxed and welcome as they make that important decision to upgrade while saving money. Visit us at 9024 Colerain Avenue in Cincinnati’s Hamilton County, where our inventory of pre-owned cars, trucks, vans/minivans, and SUVs, and customer-first business model, may just surprise you. Let us show you why.